﻿World Rhino Day: Calendar, History, Tweets, Facts, Quotes & Activities. World Rhino Day celebrates Rhinoceroses and generates awareness of issues regarding their well-being. In recent years, rhinos have been threatened by poaching, urbanization and pollution, which have left certain rhino species on the brink of extinction while leaving other species severely endangered. World Rhino Day was first planned by World Wildlife Fund-South Africa in 2010. 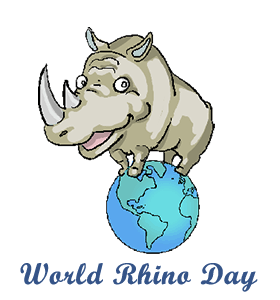 Then, in 2011, Lisa Jane Campbell of Zimbabwe and Rhishja Larson joined forces to promote World Rhino Day 2011. Since then, September 22nd has been celebrated annually by governments, animal rights organizations and animal enthusiasts as World Rhino Day. There are all five species of rhino: black, white, greater one-horned rhinos, Javan and Sumatran. All Rhinoceros are herbivores, meaning that they only consume plants, and lots of them. The Black, Javan and Sumatran Rhinoceros species are all listed as Critically Endangered, meaning that they have a 50% change of extinction within 3 generations. In 1960, there were more than 2,000 northern white rhinos in Africa. Today, there are only 2 of them remaining. The last male of the subspecies, Sudan, died March 19, 2018. He was the father and grandfather of the two remaining ones, both of which are females held in captivity in Kenya with round-the-clock armed security against poaching. The white rhino is the second largest land mammal on Earth after the elephant. White rhinos can weigh over 3500kg (7700lbs). Go to the zoo. Most zoos have special separate talks with keepers about different types of rhinos and the problems that they currently face in the wild. Spend some time learning more about other endangered species on the brink of extinction. Donate to charities and organizations that support rhinos and other endangered wildlife such as WWF, International Fund for Animal Welfare and Defenders of Wildlife. Watch a documentary about rhino poaching and extinction. Our picks: The Last Rhinos , The Price and Gambling on Extinction . Organize a fundraiser. Host a walk, jog or cycle and involve your community to raise funds for endangered animals and the global conservation efforts.